#BridalTips: Remove black spots on face with home remedies! Dear bride, you may have 99 problems, but those black spots on the face shouldn’t be one on your wedding day. Although these tiny spots are to do with genetics, hormonal imbalances, vitamin deficiencies and lack of sleep, you can totally put them to rest with these 10 awesomesauce home remedies. 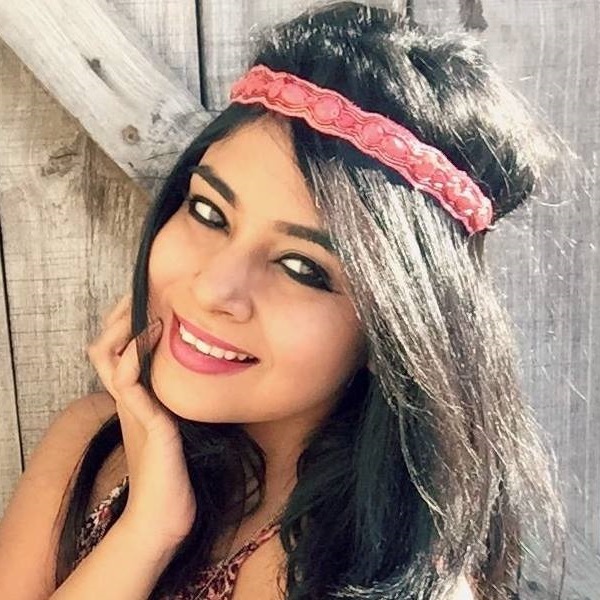 Here’s how to get rid of black spots on face naturally! Also, the remedies are perfect to remove black spots before wedding permanently! Oranges contain retinol and Vitamin C that help improve the skin’s overall texture. Gently rub an orange peel on your skin, and you’ll notice that it removes dead skin cells, black spots on face and brightens the skin at the same time! Isn’t that just what you want, bride-to-be? Step 1: Take the peels of one orange and place them under the sun for about 2-4 days to dry up. Step 2: Once they’ve dried up, use a mortar and pestle to grind and mash the peels till they turn into a powder form. Step 3: Add 3-4 tablespoons of water to the powdery mix. Step 4: Pour the citric liquid on your face and leave it to dry for about 15-20 minutes. Step 5: Wash it off with lukewarm water after. Do this twice a week for best results. Lemon juice is a wonder ingredient because it treats black spots on a face like a pro. It contains vitamin C that helps lighten dark spots. It also helps cleanse the skin as it removes dirt, grime and oil too! Yep, it’s pretty awesome that way and will ensure that you look like the flawless bride you’ve always dreamt of being. Use this to remove black spots before the wedding as it gives almost-instant results! Step 1: Squeeze the juice of one big round lemon and pour it into the bowl. Step 2: Dip a ball of cotton into the bowl and rub the soaked ball of cotton over the dark spots. Step 3: Don’t touch your face for the next 30 minutes. Step 4: Once that’s done, wash your face with cool and fresh water. Do this every day for best results. Potatoes are pretty cool because they have natural bleaching properties. This very quality helps remove black spots on face and heals scars and blemishes. 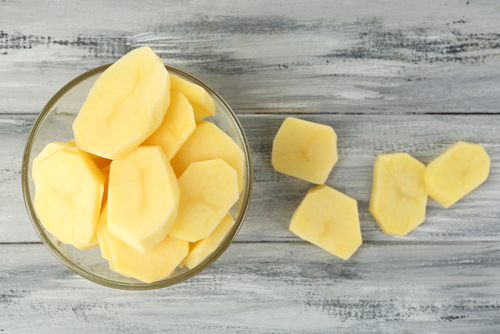 Plus, using raw potato slices on your skin will ensure that it stays healthy and glows on the big day! Step 1: Peel a potato and grate it. 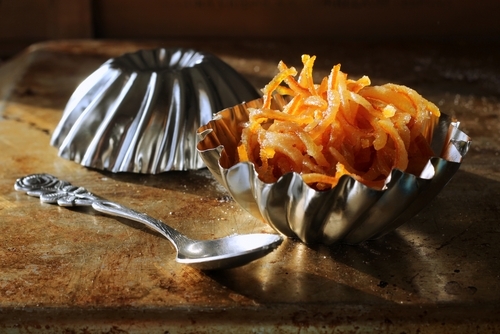 Step 2: Toss the grated potato into a bowl and drizzle some honey over them. Step 3: Dip your fingers into the gooey paste and smear it on your face. Step 4: Wait for about 45 minutes till the mask hardens up a bit and becomes thick. Step 5: Use a warm, damp cloth to wipe off the mask soon after. Do this thrice in two weeks for best results. You may or may not know this but aloe gel has healing properties! It acts as a skin corrector when dealing with dark spots and scars. Plus, it makes your skin look clearer and feel fresh after every use. A perfect go-to plant during the run-up to your wedding day, we say. Step 1: Extract the gel from the leaf of an aloe vera plant. Step 2: Apply the gel on your dark spots, acne and scars. Step 3: Rinse it off from your face after 15-25 minutes. Do this once a week for best results. 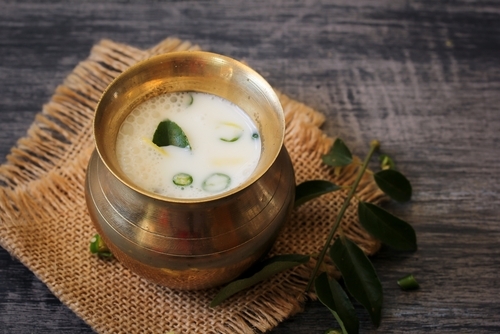 Whenever you face a burning sensation on your skin, use buttermilk. It contains lactic acid that helps soothe the rash and also helps fade blemishes and nasty dark spots at the same time. Some buttermilk for the soon-to-be brideto remove dark spots before the wedding? Yes please! Step 1: Put 4 teaspoons of buttermilk in a bowl. Step 2: Add 2 teaspoons of tomato juice to the milk. Step 3: Stir for a minute, using a spoon. Step 4: Head to the bathroom and pour the liquid on your face. Step 5: Leave that on your face for at least an hour. Step 6: You can wash it off with plain water after a while. Do this thrice a month for best results. 6. Turmeric Is Gold, Baby! From brightening your skin for D-day to healing any acne to treating dark spots - turmeric is a natural and awesome ingredient in your kitchen. It reduces skin pigmentation, tackles discoloration and prevents skin from ageing too quickly. Step 1: Add 2 tablespoons of turmeric powder in a bowl. Step 2: Add 2 teaspoons of fresh milk to the bowl and sprinkle a few lemon drops over the paste. Step 3: Stir well and apply it directly on your skin. Step 4: After a few minutes, wash your face using mild soap. Do this four times a month for best results. Rich in Vitamin E, antioxidants and healthy fats, this tiny nut goes out of its way to reduce black spots on face and scars. Plus, it helps improve your skin’s complexion by brightening it and giving it a healthy, supple glow. 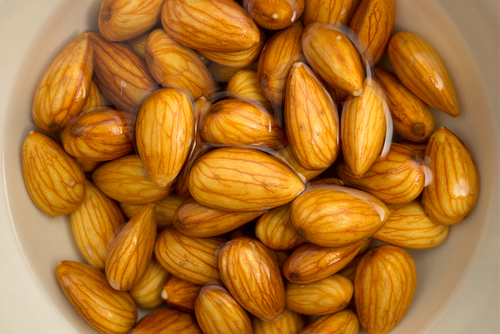 Step 1: Soak a handful of almonds overnight. Step 2: Peel the skin off the next morning and toss the peeled nuts into a mixer. Step 3: Once you’re left with a grainy paste, add a teaspoon of honey and a few drops of rose water. Step 4: Generously apply it all over your face and massage your skin using your bare fingertips. Step 5: Wash this off after 30 minutes. Do this twice a week for best results. 8. Give It Up For Onion Juice! Whether you have sensitive, dry, oily or combination skin, onion juice will take your skin under its wing. Besides healing your skin, it will also brighten it once you use it on a regular basis. This is efficient to remove dark spots before the wedding and is easy to do too! Step 1: Chop 1 raw onion into two and toss it into a juicer. Step 2: Empty the paste into a bowl and use a ball of cotton to soak the juice. Step 3: Dab it on your face directly and wait for about 10-15 minutes till it dries up. Step 4: Wash your face with lukewarm water once the paste hardens. Do this once a week for best results. 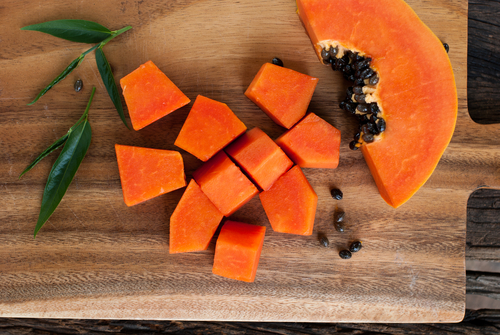 Interestingly, the papaya fruit is packed with enzymes which help fade black spots on face and even out your skin tone. Protecting your skin from the sun, the pulp of this wonder fruit also exfoliates the skin and naturally does away with dead skin cells. The fruit for your pre-bridal beauty treatments. Step 1: Scoop out the pulp of one ripe papaya. Step 2: Apply it to your skin and massage it circular motions Step 3: Leave it to dry for about 20-30 minutes. Step 4: Rinse your face with warm water. Do this thrice a month for best results.